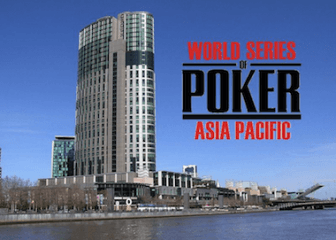 On Friday we brought you the latest news from the opening flights of the first World Series of Poker Asia Pacific tournament, Event #1 The Accumulator, and after a full slate of weekend action the inaugural WSOP APAC tournament series is now in full-swing, with the Accumulator event in the books, and two more events currently running. In this column we’ll get you caught up on all of the action from the 2013 WSOP APAC. Event #1 saw the massive starting field of 1,085 play-down to a star-studded final table on Sunday night with poker pro Brian Piccioli leading the way. On Monday Piccioli used his chip-lead to avoid a flurry of early all-ins and eventually found himself heads-up against Australian native and online poker legend Jonathan “xMONSTERxDONGx” Karamilikis. Despite the hometown support for Karamilikis it was Piccioli who came out on top, winning the first-ever WSOP APAC bracelet. After the 172 player field was whittled-down to just nine, Marvin Rettenmaier, Dan Shak, Minh Nguyen, and Mike Leah will be headlining the final table of the $1,650 PLO tournament on Tuesday. On the line for the remaining players will be the near-$70,000 first-place prize-money, and more importantly for some, the chance to collect a WSOP bracelet. Two of these players may even have more on the line, as Dan Shak is an early leader for the Player of the Year awards, while Marvin Rettenmaier is a good bet to also be in the POY mix by the end of the year. Event #3, a $2,200 Mixed Games tournament, kicked-off on Monday with a small field of 81 players registering for the event –which begs the question, where are the 1,000+ players from Event #1 and what are they doing in Melbourne? Even with the small field Event #3 could produce a very strong final table, with names like Daniel Negreanu, Phil Hellmuth, Phil Ivey, Barry Greenstein, and ElkY still in the hunt heading into Day 2.